However, there’s a whole lot more to terpenes than just smell, and you might be surprised to learn just how vital the role of terpenes is in terms of a rounded medicinal effect from cannabis. To get technical for just a moment, terpenes are secretory cells inside glandular trichomes, and their production is increased with light exposure. Terpenes are mainly found in high concentrations in unfertilized female cannabis flowers prior to senescence. Another important role that terpenes play is to protect the cannabis plant from bacteria and fungus, insects and other environmental stresses. In studies on mice and rats. A standardized cannabis extract of THC, CBD and CBN (SCE), another with pure THC, and also one with a THC-free extract (CBD) were tested on a mouse model of multiple sclerosis (MS) and a rat brain slice model of epilepsy. The study found that SCE inhibited spasticity in the MS model to a comparable level of THC alone, and caused a more rapid onset of muscle relaxation and a reduction in the time to maximum effect than the THC alone. Enter Dr. Ethan Russo, who came up with the ‘Entourage Effect’ theory some years ago, claiming that terpenes compliment the active compounds in cannabis by inhibiting the effects of THC. According to Russo et al, terpenes increase the potential of cannabis-based medicinal extracts to treat pain, inflammation, fungal and bacterial infections, depression, and anxiety. The Terpene Wheel is a handy diagram which illustrates the differences between terpenes and offers additional information about them. Green House Seed Co’s wheel identifies the various terpenes in each of their strains. Let’s take a closer look at some of the main terpenes found in cannabis, as well as in a variety of other plants, fruits and herbs. Pinene has a distinctly piney aroma, and is also found in pine needles, rosemary, basil, parsley, and dill. There are two types of this terpene, α-pinene and β-pinene, and both have been associated with the treatment of asthma, containing antiseptic properties, and also anti-inflammatory elements. Pinene is said to promote alertness and memory retention, and can be found in strains like Jack Herer, Chemdawg, and Bubba Kush. Mycrene is another well-known terpene which smells musky, earthy, and has been closely associated in aroma with cloves, with some citrusy notes. Mycrene is thought to enduce the well-known ‘couchlock’ effect, leaving the patient slightly numb and with a substantial body sensation. This terpene has been used in the treatment of numerous conditions, as it acts like a potent analgesic, with anti-inflammatory, and antibiotic properties. Mycrene is prevalent also in mangos, and is found in strains like Pure Kush, El Nino, and White Widow. Limonene is another top-shelf terpene which, as is suggested by its name, is very much on the citrusy scale, inducing a euphoric feeling, elevated mood and stress relief. Limonene-rich strains can smell of oranges and lemons, as well as being present in herbs such as rosemary, juniper and pine needles. This terpene is thought to be an ideal antifungal agent, and also could be effective when it comes to weight-loss. Limonene-rich cannabis strains include, Super Lemon Haze, Jack the Ripper, and Lemon Skunk. Linalool is another favorite terpene among cannabis patients, due to its lavender, floral aromas, and sweet notes. Used in the treatment of anxiety, and as an anti-convulsant, and anti-depressant, this pungent terpene is thought to be very effective in the treatment of numerous medical conditions. You could find this terpene in high concentrations in strains such as, G-13, Amnesia Haze, and Lavender. This terpene is reminiscent of peppercorns, with a slightly spicy aroma, which come people describe as ‘woody.’ Caryophyllene, or Beta-caryophyllene, as it is known technically, is considered to be effective in treating gastro issues, arthritis, ulcers and autoimmune diseases. Caryophyllene is the only terpene known to interact directly with the human endocannabinoid system, with some studies showing it to hold promise in some cancer treatments. Strains rich with this terpene include, Hash Plant, Northern Lights, and Afghan. The wonderful world of terpenes is one that requires a lot more exploration and research. In order to gain a better understanding of how these gifts from nature could help patients around the world who are suffering from a variety of different conditions and ailments. The easiest way to understand them is to think of them as volatile aromatic molecules. What’s so special about these chemicals is that they give plants their unique aroma. From the chemical point of view, terpenes are derived from the basic molecule of isoprene which replicates to make terpenes. These substances have two very important roles in every plant’s life: to protect the flowers from predators and to produce resin. What we usually consume from cannabis is the flower. And just like any other flower, cannabis flower has its own recognizable smell. Some of those terpenes can be found in other plants, while others are exclusive to cannabis. They interact with our endocannabinoid system and assist cannabinoids in entering the bloodstream, in a process called the entourage effect. Myrcene, for instance, increases cell permeability and allows cannabinoids to be absorbed faster than they would on their own. According to Chris Emerson, these compounds work together to make “the sum of all the parts that leads to the magic or power of cannabis”. When terpenes work with cannabinoids like CBD and THC, they form a sinergy that creates stronger and better effects than both would achieve on their own. Some terpenes are very effective in relieving stress, others are great when you need to relax, while there are some that boost focus. There are many options here, as you’ll have a chance to see. For example, myrcene induces sleep, while limonene uplifts our mood. 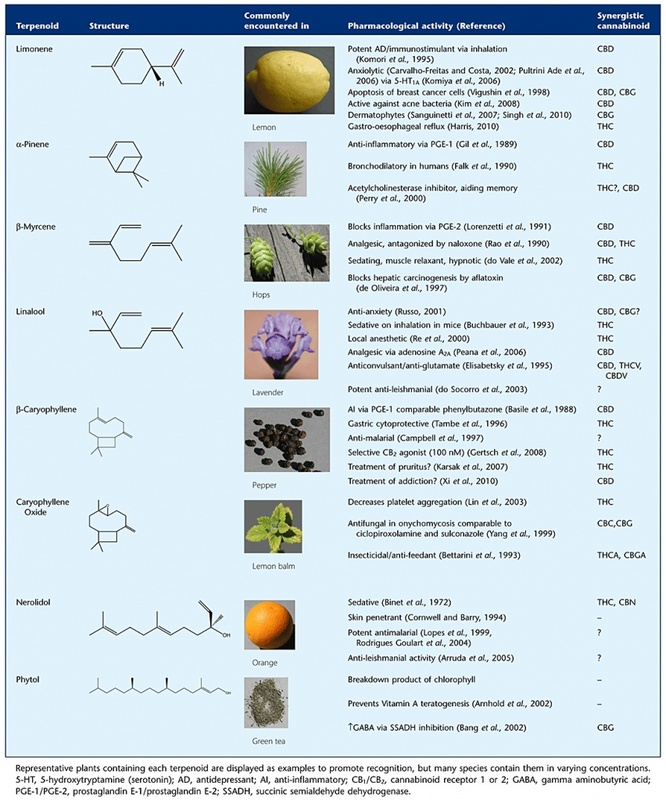 In recent years, terpenes found in cannabis became an important subject of scientific research. It was Jürg Gertsch who first noticed the ability of beta-caryophyllene to bind to the CB2 receptors, calling it “a dietary cannabinoid”. 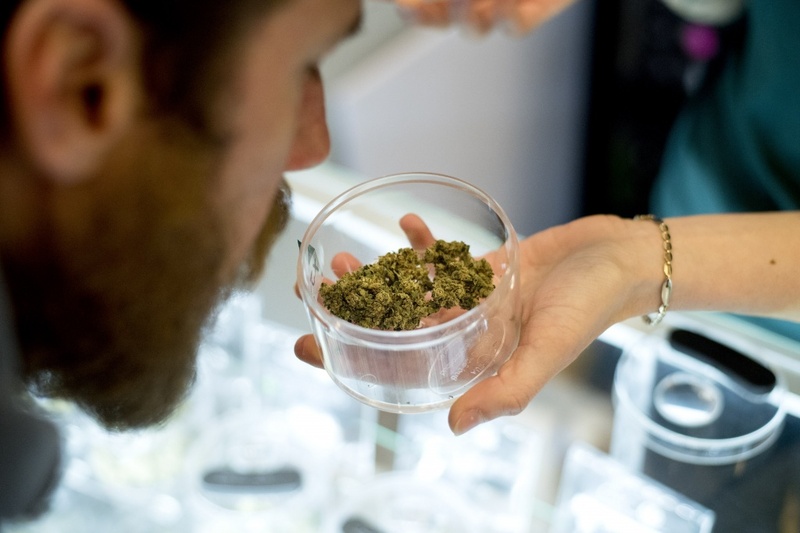 Shortly after that, Dr. Ethan Russo published an article in 2011 in British Journal of Pharmacology, which pointed to all the therapeutic properties of terpenes in marijuana, especially those missing in cannabis products that only contain CBD. Further research discovered that terpenes, terpenoids, and cannabinoids have the potential to kill respiratory pathogens, for instance the MRSA virus. However, that’s not even half of the story. Terpenes have a lot more health effects which we’ll discuss next. As I mentioned before, there are more than 100 terpenes in just one cannabis flower. Here are some of the most well known terpenes right now, most of which you’ll find in legal cannabis products in your area. Myrcene is the most abundant terpene in cannabis, which is where it’s mostly found in nature. In fact, one study showed that myrcene makes up as much as 65% of total terpene profile in some strains. Myrcene smell often reminds of earthy, musky notes, resembling cloves. Also, it has a fruity, red grape-like aroma. Strains that contain 0.5% of this terpene are usually indicas with sedative effects. It has also been reported that myrcene is useful in reducing inflammation and chronic pain, which is why it’s usually recommended as a supplement during cancer treatments. Bonus tip: If you want to experience a stronger buzz from marijuana, get yourself a mango and eat it about 45 minutes before smoking. Mango contains significant amount of myrcene, so eating it before consuming cannabis will strengthen the effects of THC and increase its absorption rate. Limonene is the second most abundant terpene in all cannabis strains, but not all strains necessarily have it. As its name says, limonene gives strains a citrusy smell that resembles lemons, which is no surprise as all citrus fruits contain large amounts of this compound. Limonene is used in cosmetics and also in cleaning products. For therapeutic purposes, limonene is known to improve mood and reduce stress. Researchers also found it to have antifungal and antibacterial properties and one research even found it to have a role in reducing tumor size. High levels of limonene can be found in strains like O.G. Kush, Sour Diesel, Super Lemon Haze, Durban Poison, Jack Herer, and Jack the Ripper. This terpene is the most responsible for the recognizable marijuana smell with its spicy and floral notes. Linalool is also found in lavender, mint, cinnamon and coriander. What’s interesting is that just like those aromatic herbs, it has very strong sedative and relaxing properties. Patients suffering from arthritis, depression, seizures, insomnia and even cancer, have all found aid in this amazing terpene. Some well known linalool strains are Amnesia Haze, Special Kush, Lavender, LA Confidential, and OG Shark. Best known for its spicy and peppery note, caryophyllene is also found in black pepper, cinnamon, cloves, and spices like oregano, basil and rosemary. Besides its analgesic and anti-anxiety properties, some studies have found that caryophyllene has some very promising properties when it comes to alcoholism rehabilitation. A group of scientists performed research on mice and found that this terpene reduces voluntary intake of alcohol. They even recommended caryophyllene for treating alcohol withdrawal symptoms. You can benefit from caryophyllene by using strains like Super Silver Haze, Skywalker and Rock Star. These two terpenes smell like pine trees and that’s also where they can be found in large amounts. Other plants rich in pinene include rosemary, orange peels, basil, parsley and cannabis of course. You can find pinene in strains like Jack Herer, Strawberry Cough, Blue Dream, Island Sweet Skunk, Dutch Treat and Romulan. Alpha-bisabolol (also known as levomenol and bisabolol) has a pleasant floral aroma and can also be found in chamomile flower and candeia tree. This terpene found its use primarily in the cosmetics industry, but lately it has caught the attention of researchers since it showed medical benefits, especially in cannabis. Also known as cineole, eucalyptol is the primary terpene of the eucalyptus tree. It has recognizable minty and cool tones in its smell but most cannabis strains do not contain large amounts of it. It usually makes up around 0.06% of a strains complete terpene profile. This terpene has been used in cosmetics as well as medicine. When it comes to its medical value, eucalyptol relieves pain but also slows the growth of bacteria and fungus. Although it is still in the early stages in research, this terpene has shown some promising effects on Alzheimer’s as well. This one is a secondary terpene found mostly in flowers like jasmine, lemongrass, and tea tree oil. The smell of trans-nerolidol reminds of a mixture of rose, citrus and apples and can be described in general as woody, citrus and floral. Strains like Jack Herer, Sweet Skunk, and Skywalker OG are rich in nerolidol. Humulene was the first terpene found in hops. Its aroma contains earthy, woody and spicy notes. It has a variety of medical properties. Early research has shown humulene to be anti-proliferative, meaning it prevents cancer cells from growing. Also, it proved to be effective in suppressing appetite, making it a potential weight loss tool. Furthermore, like many other terpenes mentioned above, it also reduces inflammation, relieves pain and fights bacterial infections. This terpene is found in a number of plants like rosemary, basil, bell peppers, cedar and pine. Its aroma is sweet and resembles the smell of cypress tree. When it comes to the medical side of carene, it seems to be mostly beneficial in healing broken bones. That gives hope to patients suffering from osteoporosis, arthritis and even fibromyalgia. What is also interesting about this terpene is that it stimulates our memory and helps memory retention. This is a major point in finding a cure for Alzheimer’s disease. The best way to describe the smell of camphene is fir needles, musky earth and damp woodlands. Camphene aroma is often mistaken with myrcene, which is that trademark marijuana smell as most of us know it. From the medical point of view, camphene has great potential. When mixed with vitamin C, it becomes a powerful antioxidant. It is widely used in conventional medicine as a topical for skin issues like eczema and psoriasis. Its greatest potential lies in its ability to lower the levels of cholesterol and triglycerides in the blood, further lowering the risk of cardiovascular diseases. Borneol, with its herbal minty scent, can be found in herbs like rosemary, mint and camphor. This terpene is a good natural insect repellent which makes it great in preventing diseases like the West Nile virus, being passed by ticks, fleas, mosquitoes etc. One study found that borneol kills breast cancer cells. It’s also widely used in Chinese traditional medicine, in acupuncture to be precise. The aroma of terpineol can be best described as floral-like, reminiscent of lilacs, apple blossom, and a little bit citrusy. Terpineol tastes like anise and mint. Terpineol has a pleasant scent, similar to lilac, and is a common ingredient in perfumes, cosmetics, and flavors. It relaxes heavily and it’s usually the one responsible for the notorious couch lock effect. Medical benefits of terpineol also include antibiotic and antioxidant properties. This terpene got its name from sweet Valencia oranges — where it’s been found in large amounts. With its sweet citrusy aromas and flavors, it’s used as an insect repellant, too. Besides cannabis, geraniol can be found in lemons and tobacco. Its smell reminds of rose grass, peaches and plums.